For this weeks photo challenge I went immediately to an old jewelry box and looked inside. I recall rummaging through my grandmothers costume jewelry like a pirate with precious booty. 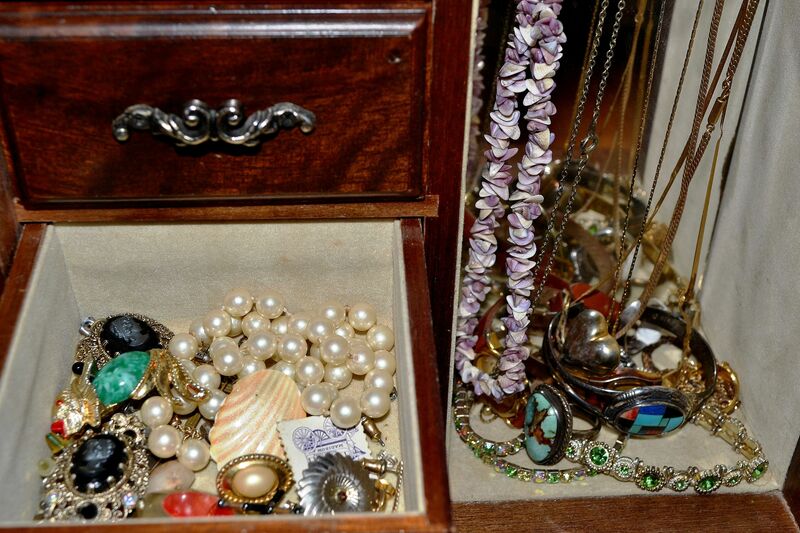 Mine is filled with trinkets of cheap metals, faux pearls and inexpensive stones but they are treasures to me and every piece holds a dear memory of the bestower. This weeks theme also inspired me to share a prose from Interior Verse (which is free via kindle right now) titled The Chest of Hope. 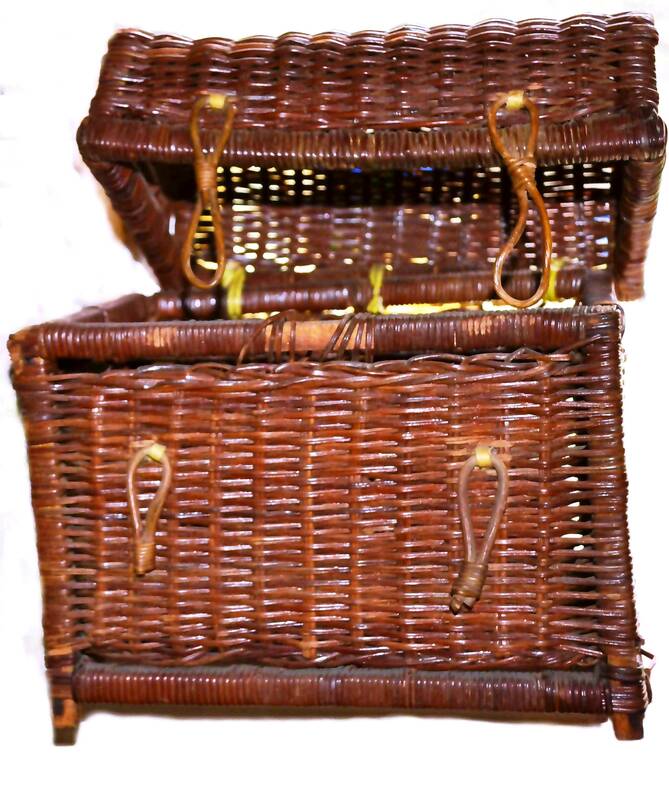 It’s just a small brown wicker basket not built to hold much and a bit tattered from over handling. Its beautiful warm browns have dulled and faded with age on the outside but inside the natural luster still shines. Its top is held in place by make do leather ties because the first woody hasps were worn in two and now dangle loosely without purpose. What hands made the airy coffer? I wonder as I stroke the thin smooth fibers. Was it one as handsome as the tight weaves frayed by time? A place to store my breathing dreams so that they could be kept safe and close at hand, amassed in a beautiful fibrous reminder. A quaint little chest of hope I will one day hand down to a child, a grand child or perhaps even a great grand child when I have used up its contents. When I have taken the dusty lid off one last time and felt deep into the corners to make certain I haven’t left any ideas untouched. I imagine when I offer it up to him or her they will look at me like I’m crazy (and I may well be) then they’ll tear the lid off expecting to find a treasure of sorts before saying with disappointment, “It’s just an empty old basket.” It is then I will share with them the wishes and ideas that were stored and later born of that basket. How they were kept safe till I could see them come to fruition. And one more time I will imagine the handsome dark skinned man who meticulously weaved the wonderful piece…a place to store my dreams because dreams need room to breathe. Then I will show them how to place their own aspirations into the old auburn chest with caution to keep them safe, to nurture their hopes and give them time to mature. And if my last wish were to come true I will see them realize the birth of their visions. The Chest of Hope is a nice piece – thanks for including it. I also remember digging through my Nana’s “costume jewelry” and trying pieces on! (Of course, she kept the better items in a separate place, but I felt all dressed up and gorgeous! Love the idea…chest of hope. We all need a dose of hope everyday. Beautiful jewelries. They say, it is not the amount that matters but the thought and love we put into it. Priceless!